Hey party people! I’m crying a little (okay, a LOT) on the inside because today is my last full day in NYC! And also because the mayor said I couldn’t take NYC home with me. If I recall, his exact words were, “miss, it is physically impossible to take home an entire city, now please leave.” Clearly the mayor doesn’t understand science. Anyway, last year I visited NYC for the first time and fell in love with it and the girl who let me crash on her couch, Kayle from the blog, The Cooking Actress! Kayle is as sweet as she sounds on her blog, with an infectious smile, great acting chops, and scrumptious recipes that she crafted in her tiny apartment kitchen. I had a BLAST while she showed me around NYC & I am so sad I won’t be seeing her this trip since she moved back to the Buckeye State, Ohio. *shakes fist at Buckeyes* Buckeye people definitely don’t deserve to eat her nutty Pecan Lacey Cookies or her S’mores Lava Cakes — I do! I do! However, maaaaaybe I can arrange us to surprise land in Ohio so I can sneak a taste of these cookie dough cups… 🙂 Okay, take it away, Kayle!! Hello there domestic rebel-ers!! Kayle here from The Cooking Actress (in case ya didn’t guess-I’m an actress…who cooks…)-and I am SO excited to be here! Hayley has already guest posted for me twice (with her insanely delicious Creme Brulee Cookies and Gooey Texas Sheetcake!) so I am so happy to return the favor. But…I’m also a little bummed. You see, Hayley and I became super tight when she came to visit me in New York City last year. A few months ago I relocated from NYC to my hometown in NE Ohio and nooow Hayley is in New York WITHOUT ME! I’m so sad. She’s probably eating cannoli, the best pizza in the US, Wafels and Dinges, and who knows what other kinds of tastiness! Even though I am totally jealous and wishing I could be there with her, I’m also hoping she has a ton of fun. Enough about Hayley, NY, and moi, let’s talk sweets! When trying to decide what recipe to share, I had to make sure it was something worthy of The Domestic Rebel. I couldn’t just make cookies! No, it had to be something somewhat mad-scientist-y, and insane in the amount of yum (I mean-I can’t even handle the ccc dough brownie bombs…or like anything Hayley makes! HER BRAIN THINKS OF THE MOST EPICLY DELICIOUS THINGS), because that’s how things roll over here. And ya know what? I think you guys are going to love these luscious little candies. 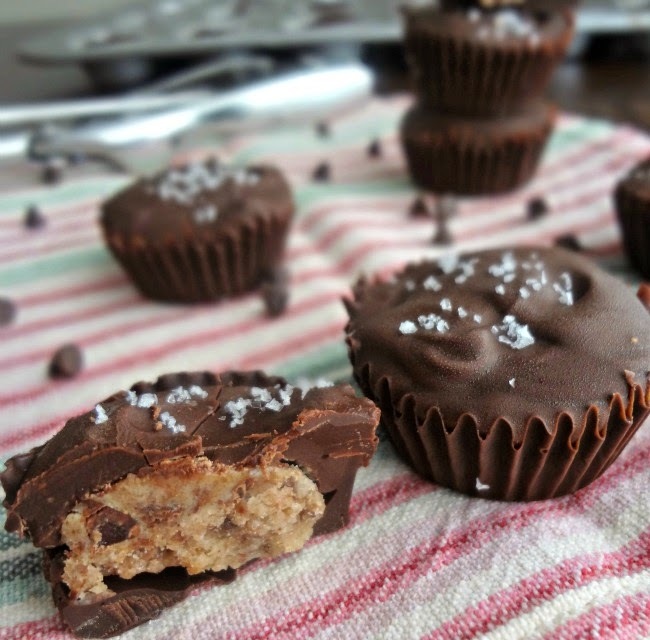 You know peanut butter cups, right? Of course you do-we all know and love ’em. But you know what else we love? Sooo….maybe we browned some butter (because I want to put brown butter in all the things-the flavor is always so rich and complex) and made some peanut butter (eggless!) cookie dough. And perhaps we encase that in dark chocolate. Maybe we also sprinkle some salt on top, because sweet & salty is EVERYTHING. And then maybe we’re gonna eat like 10 of these cookie dough cups because they’re so good you just can’t stop. 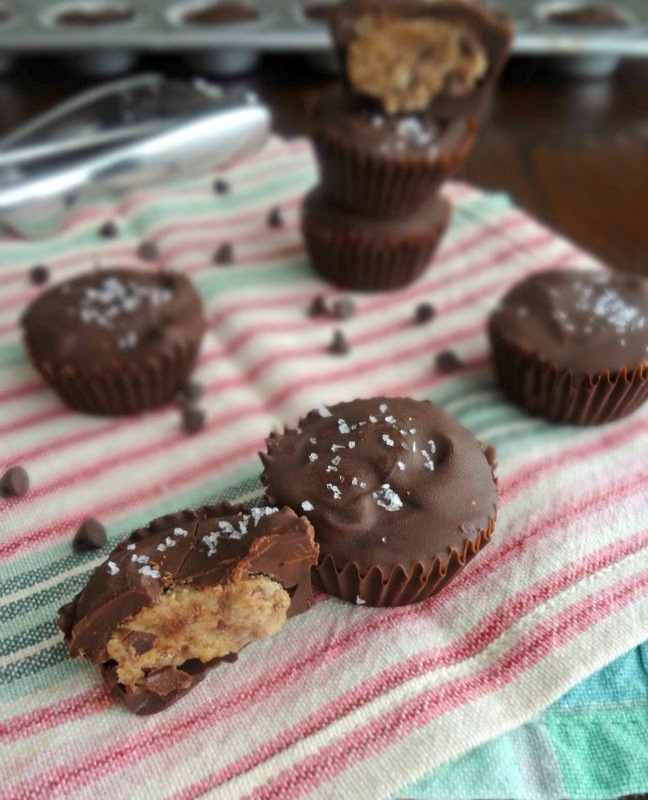 Nutty, caramel-y brown butter meets creamy, salty peanut butter in these sweet-and-salty Cookie Dough Cup candies from the genius Kayle, who blogs over at The Cooking Actress! In a saucepan melt butter over medium-high heat, whisking constantly, as it foams, bubbles, and eventually turns amber with little brown flecks. Immediately add in the brown sugar and remove from heat. Whisk until the sugar is dissolved-approx. 2 minutes. In a heatproof bowl, heat 1 cup dark chocolate chips in a microwave on high power in 30 minute increments (stirring after each time) until melted and smooth. Drop approx. 1 tsp. chocolate into each lined cup and use a pastry brush to brush the chocolate up the sides of the liners. Freeze for 20 minutes. Once the peanut butter mixture is cooled whisk in the powdered sugar, flour, and salt until smooth. Stir in the mini chocolate chips. Let the dough refrigerate until hardened-about 20-30 minutes. Once the chocolate and cookie dough are fully chilled, scoop about 1 tsp. sized pieces of dough and form into little balls. Place inside each of the chocolate cups. Freeze 10-15 more minutes. Melt the rest of the dark chocolate (same way you did last time) and cover each cookie dough filled cup, using a spoon to smooth it all over. If you guys aren’t following Kayle yet, you MUST! Be sure to give her likes, follows and LOTS of love to stay connected to her adventures (she’s getting married soon!) and for more scrumptious recipes like this! Yum! 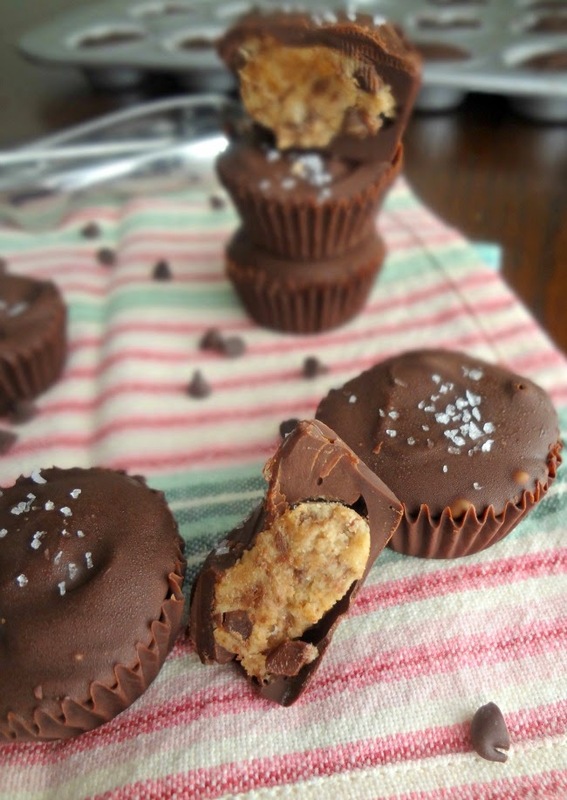 These are totally decadent and delicious! I totally love you though and am so happy I was able to guest post! It looks like you’ve had a blast in NY! Sadness that you are leaving and that the Mayor is uncooperative and that you didn’t get to visit the amazingness that is Kayle this trip! I was super lucky to catch her the week before she left!!! 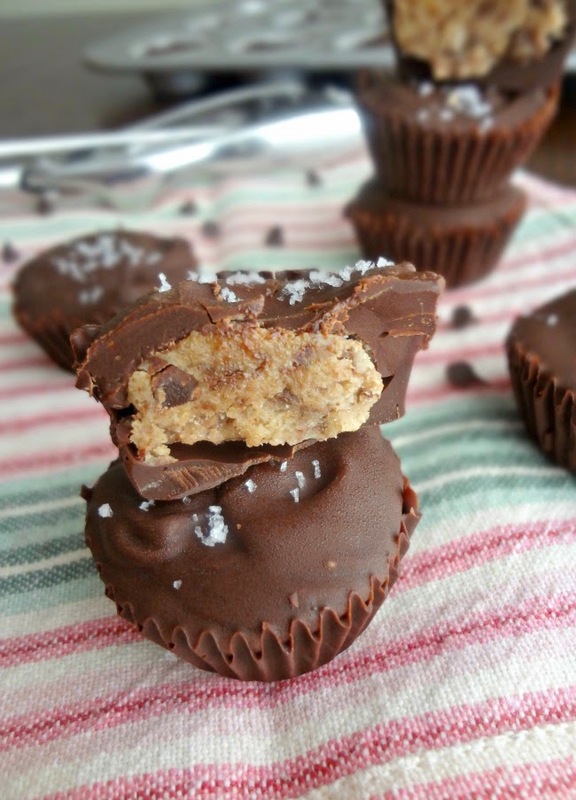 These cookie dough cups look fabulous! I want. SO fun to find Kayle guest posting here. Hope you had a terrific time in NYC…and hoping Kayle sends both you AND me a box of these insanely good bonbons! Had to come here to look at more pics of this awesomeness! Love. These look so good. My husband would love them. Thanks for sharing. IS the sugar and flour measurements correct? My batch is way too soft and I would have to add one or the other to have it firm enough to make into balls. It does taste good though. I double checked the recipe and I made it the way it says. Hi Betty! This isn’t my recipe (it’s a guest post from another blogger) so I can’t be entirely sure if the measurements are correct. I’m sorry you had issues, but at least they tasted good!